Ryan places the angel on the tree. No, he no longer needs a chair. Yes, that is his pull-up bar in the background. ‘Tis the season for giving thanks, and for celebrating miracles, no matter how minor. We bought our Christmas tree on Saturday. We decorated it on Sunday. Both of these events came off without any major issues. Ryan took part in both, albeit at his own pace. And perhaps most importantly, Veronica and I recognized that the key to family harmony was to let him participate at his own pace, and not insist he take part fully in an activity that didn’t really interest him. After our experience two years ago, some of Veronica’s co-workers reminded her that Ryan’s disinterest in trimming the Christmas tree probably had little to do with his diagnosis and lot to do with him being a 12-year-old boy. It was with that in mind that we set about decorating the tree yesterday. We let Ryan go off and do his own thing while Riley hung most of the ornaments. Veronica set aside several of the hockey-themed ones for Ryan. When it was time, she called him down and he came willingly and hung them on the tree. There was no controversy, no pleading, no complaint. When Riley tried to claim, for about the ninth year in a row that it was her turn to place the angel atop the tree, Ryan protested. He had heard us read the note in the ornament box proclaiming 2014 to be his year. He carefully placed it atop the tree, and we were done. It should be noted that he no longer needs a chair to reach the top. It came off havoc free, and with family harmony intact. A Christmas miracle, indeed. 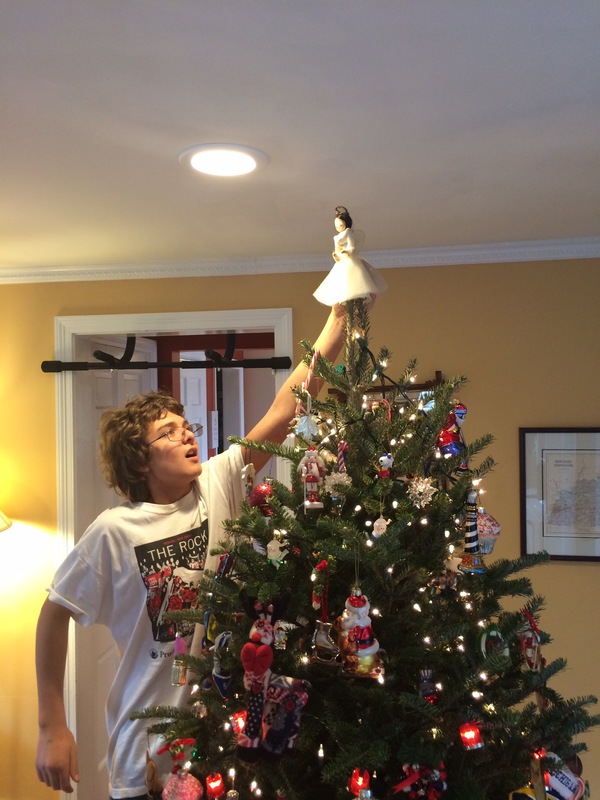 Our son has never really been interested in trimming the tree – playing with the ornaments, yes. Putting them on the tree, not so much. It was one of those little parent fantasies that I had to let go of over the last 10 years.